Jonathan & Amy: I can bake a cherry pie! Contrary to what I normally post about, we do cook at home. Lasagna is probably the most frequent meal (aside from pizza) that we make. But rarely do we do dessert, unless it's a special occasion of sorts. Don't get me wrong, I love dessert, but Jonathan lacks the sweet tooth I do and so cakes never get finished in our household. Well, we had picked up a few pounds of Rainier cherries, a favorite of Jonathan's. They were at Costco, so we got quite a deal. We didn't get through most of them before they began to spoil, so Jonathan suggested a pie. I couldn't find a recipe that specifically mentioned this type of cherry, so I altered a regular fresh-cherry pie recipe a bit. 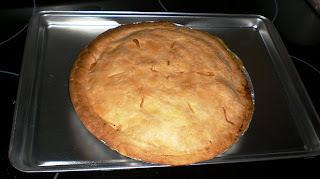 It was also my first venture into double-crust pies as well, and I was quite nervous about it. Pitting the cherries took about half an hour, just to get 2 1/2 cups of fruit. I hadn't thought about how long that would take when I began, but at least the top part of the crust wasn't as difficult as I had envisioned. I used the "slits" method with a smooth edge instead of a lattice or scallop edge (or anything else fancy). I also panicked that I'd burn the top crust, since the recipe called for 40 minutes in a 400-degree oven. 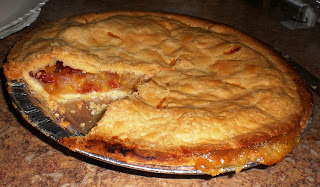 But, it all turned out okay, and the crust held most of the way, allowing a bit of filling to seep out on one side. 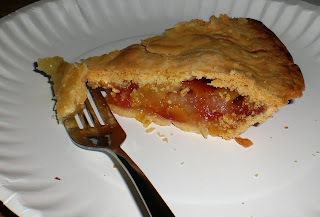 Cutting into it, the filling was thick, and mostly yellow (as is the flesh of a rainier cherry). Jonathan and I both found it to be delicious, and he mentioned that we should keep the recipe around for special occasions. I was pretty excited that he liked it that much... I know that he has quite high standards when it comes to cherry desserts!